For sailor Tom Wells, music is the mainstay. A thought, a conversation, or a fleeting idea may result in a quick composition. He writes the lyrics and music in a matter of minutes when an idea strikes and many of these on-the-spot songs end up in his repertoire. His love of sailing and understanding of the sailing life shine through. But in spite of frequent requests for CDs, none of the songs in Tom's growing repertoire had been recorded until now. At long last, Tom has produced his first two albums. He did this simply without a recording studio or a backup band. The first is Song of the Sailor, so named after one of the 12 songs in the collection. This album is best described as his serious and philosophical collection. 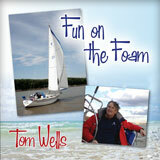 The second is named Fun on the Foam and includes 12 of Tom's more light-hearted songs. Tom has a big voice that is well suited for the songs he creates and for leading cheerful fellow sailors in impromptu sing-alongs. 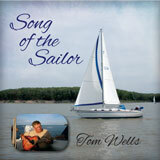 Both albums showcase a nice variety of musical styles and sailing subjects. You can hear free samples of seven of his songs at AudioSeaStories. His albums are available for download at AudioSeaStories, Good Old Boat magazine's downloads site. They're $9.95 each. He will also be selling limited numbers of CDs. For more information or to purchase CDs (rather than downloaded files), contact Tom at t37224@centurytel.net. If you want CDs (rather than downloaded files), Tom is selling those for $15 each or $25 if you want both albums. This covers his costs for the CDs and mailing them to you. He can accept a check, money order, or cashier's check (no credit cards please). In addition to your check, Tom will need your address, phone number, and email address. You may know Tom as one of the Good Old Boat contributing editors who writes frequent boat reviews. Or you've heard him sing and play his guitar at the Good Old Boat booth at a boat show. Or you've noticed his name on our masthead as the official magazine "Troubadour." (It's an unusual title. But he earned it.) You may also want to know that he's a structural engineer who sails a Tartan 37 with his wife, Sandy. What's more he has written and published a novel about sailing. Superior Run, a thriller that takes place on Lake Superior, is available from Amazon. Chesapeake Bay is the location for his next novel.